Le’Veon Bell, to the surprise of his teammates, did not make an appearance at the Pittsburgh Steelers practice on Wednesday. Given the comments that his agent made that same day, it appears as if Bell will not be returning to the team in the near future. The next man up is second-year running back James Conner. Many know his story for reasons outside of the football field and deservedly so. After suffering a torn MCL in the first game of his 2015 season at the University of Pittsburgh, Conner later found out that he had been diagnosed with Hodgkin’s lymphoma. He went on to recover from his knee surgery, beat cancer, return to the football field in 2016 and be drafted by the Steelers in the 2017 NFL Draft. What many people don’t know about Conner is just how high of a level he has played at when on the football field and fully healthy. 2014 was the first season that PFF began grading every player on every play at the FBS level in college football, and that year Conner made his mark. That season, he rushed for 1,765 yards, 26 touchdowns and finished as the highest-graded college running back. Behind him were the likes of Ezekiel Elliot, Kareem Hunt, Melvin Gordon and Todd Gurley. Not only that, but his 2014 grade was higher than the likes of Leonard Fournette, Christian McCaffrey, Alvin Kamara and Dalvin Cook the following year. Conner’s overall grade of 92.4 in 2014 remains the third-highest grade ever given to a running back in the PFF college era (2014-present). He was a very hard man to bring down that year. Conner forced 88 missed tackles rushing which was 15 more than any other running back that season, and the second-highest total recorded by a running back in the last four seasons. 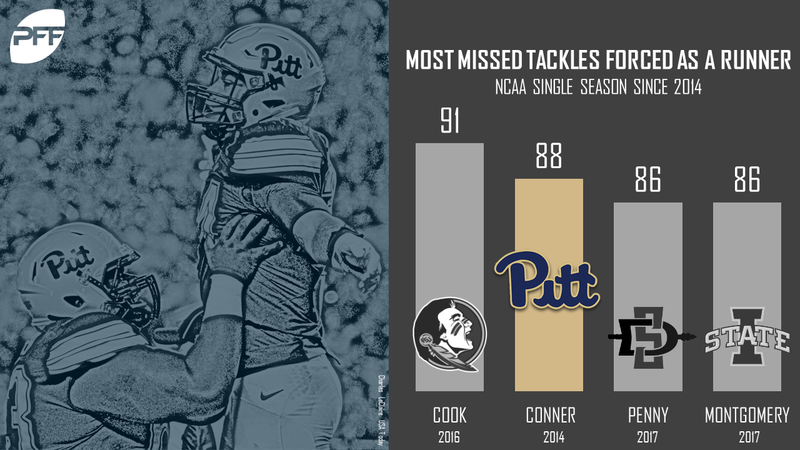 Only Cook has forced more missed tackles on the ground in a single season since with 91 in 2016. After putting together one of the best seasons for a collegiate running back in recent history, Conner was sidelined for the 2015 season with the torn MCL and Hodgkin’s lymphoma but returned in 2016 to put together another productive year despite not being at full strength. In 2016, Conner ran for over 1,000 yards and 16 touchdowns, finishing with a more modest grade of 73.1, which is still above average. Given the team that he was drafted by, though, Conner has not had much opportunity to prove himself at the NFL level yet. Bell had established himself as the best running back in the NFL and as an absolute bell-cow running back before Conner’s arrival. Last season, Bell saw 406 regular season touches which were 60 more than the next closest player – LeSean McCoy. That left only 32 touches, all of which were rushing attempts, for Conner. Bell’s absence throughout the offseason workouts, training camp and the preseason this year has given Conner another year to gain confidence in the offense and receive more reps, especially first-team reps.
That confidence in Conner from Tomlin was deserved given how well he played this preseason. 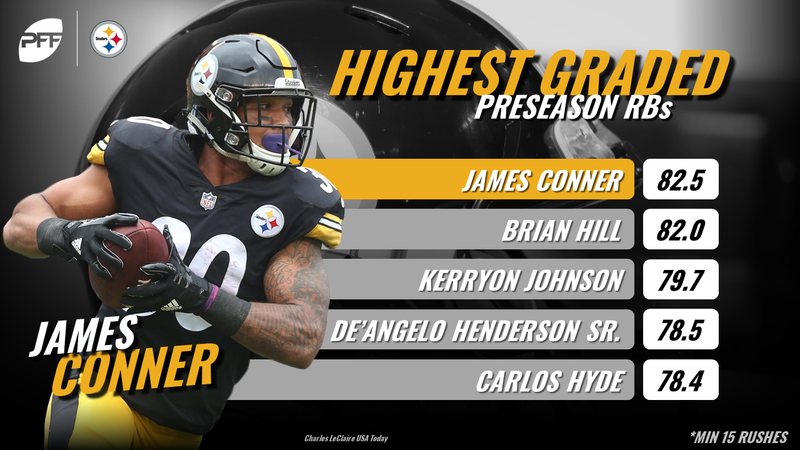 Conner recorded an overall grade in the preseason of 82.5 which led all running backs with at least 15 rushing attempts. 79 of his 100 rushing yards came after contact, and he forced five missed tackles rushing alongside four missed tackles as a receiver. In fact, it is Conner’s development as a receiver that really makes him a more viable replacement for Bell. His preseason receiving grade of 82.6 ranked in the top 10 of all running backs, as he caught all seven of his targets for 61 yards. In his standout 2014 season at Pitt, Conner wasn’t utilized much in the receiving game at all, receiving only seven targets and catching five of them. His receiving grade that year was 66.1 but in 2016, he was used slightly more as he was targeted 24 times and upped his receiving grade to 73.2. The Steelers, however, appeared comfortable looking in Conner’s direction out of the backfield this preseason just as they do with Bell. In the “dress rehearsal” Week 3 of the preseason, Conner ran 26 routes and was targeted six times on just 39 offensive snaps. That kind of pass-game usage shows that the Steelers have confidence in Conner as a receiver, which is key for him as he starts this weekend in place of Bell. It certainly sounds like the Steelers offensive line has confidence in Conner, and they should, given the ability that he has shown on the football field when the opportunity has presented itself. Bell’s holdout gives Conner an opportunity to show his talent at the highest stage – a starting running back for one of the most talented offenses in the NFL.